Even though Burnin' was fun, it left me feeling mixed up inside. I was a little confused about my win because stopping at 5 laps just seemed....not as soul-crushing as what I'd been mentally preparing for. In 2011, Wendy rocked 6 laps for the buckle. The year before that, Jen Goldstein pumped out 7. Don't get me wrong, I was just as thrilled to start partying early as Wendy was, but waking up the next morning, I honestly felt a little unworthy. My only consolation was that the women's 6hr winner completed 4 laps so at least I had one more than her. There was also some post-race drama that left me feeling hollow and sad. I won't go into it because that's not you came here to read. But, everything combined had me bummin during the week after Burnin and really unsure if I should even start the next (and final*) race on my 2012 calendar: a 55-mile mountain bike event known around these parts as the BT Epic. I expressed my reservations to a few friends and even proposed racing as a team to cut my mileage down. I figured it would be a game-day decision how far I would be racing, or if I would even be racing at all, or maybe just riding. All of these options were big red flags to my psyche: I had lost my stoke. I can come up with a million reasons why my stoke had gone missing. I have had a long season with some big efforts and big results (for me). I haven't exactly put in a consistent/focused training block since Ironman Couer d'Alene, instead just making occasional deposits to and frequent withdrawals from the EK Bank of Fitness. And mountain biking is much much harder on your aerobic system than triathlon is, making those sub-MAF rides a thing of the past. I started looking past the race and craving some solid base-phase training. It's not exactly a good sign to be craving a heart rate in the 130s when you need 6+ hours of 165ish to get the job done at BT Epic. Running from zombies. Nerd alert - I wore my compass for this race. Photo by John Peiffer. Then, this weekend happened. Despite my opinion that adding zombies (or obstacles, yes I went there) to any race makes it less credible and more trendy, I raced in the Ballwin Series' Zombie Chase on Saturday morning. And get this...it was fun. I won overall (not just female overall, but overall overall) and got a plastic skull for my efforts. But the cool thing was seeing a bunch of people (kids especially) out running around in the woods. These people may not have raced if the zombies weren't chasing them. 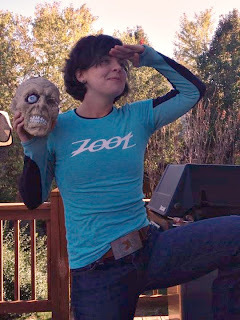 I left Castlewood full of appreciation for just getting outside, doing your best, and yes, zombies. Me, zombie, zombie, One-Arm James, zombie, Jeff. Also note zombie in background on a cell phone...calling for MORE BRAINS?! Photo by John Peiffer. After the race we had a Pfoodman team bbq to eat the leftovers (trust me, we had lots) from Burnin', and I wore my newly-belted buckle. My teammates thought it was really cool, and they reminded me that a buckle is a buckle is a badass buckle. And I couldn't have done it without their heckling encouragement on Friday, help in the pit during the race, help climbing the podium and then returning to my tent on Saturday night. The stoke started to seep back into my veins. Skull and a buckle. Photo by Ralph Pfremmer. Then on Sunday I hit the road with HH to pre-ride the south loop of the BT Epic course. It's probably a little much to drive the 3+ hour round trip to Berryman for a 2hr ride, but neither of us had seen the south loop and wanted to check it out before race day. And I had a borrowed bike that I needed to test. I rode a sick Air9 from one of my Pfoodman teammates, and that combined with the easy pace and beautiful woods made for a full-on stoke recharge. Then to top it all off, we met the BT Epic promoters Scott and Jake at the end of the singletrack. They were out marking the course and were excited to hear we were racing. They were excited to tell us their plans for the drop bags. They were excited to tell us stories about past years. They were most of all excited to tell us about the post-race party and how fun it will be to stay at Bass on Saturday. Meeting them, seeing the hard work they were putting into their event, just completely sealed the deal for me wanting to race and to race hard. The stoke had returned. To put things truly over the edge, after the ride we were loading bikes and we hear this large truck pull up. It's Scott and Jake again, finished with their day's trail prep, cruising by the parking lot to see if we were still there and offer us a beer. These guys are so awesome. We all had a drink and talked about the upcoming weekend. They had the stoke and they were sharing it. Thumbs up for rock and roll. 2010 BT Epic course. 55 miles of mostly singletrack in Mark Twain National Forest. This weekend was exactly what I needed to turn my frown upside-down. The trail is in awesome shape, the pre- and post-race gatherings are going to be amazing, and the most crazy-nice bike I've ever ridden is ready to crush some singletrack. I have several badass friends racing on Saturday too, and even if my legs don't show up, it's going to be an honor to share the trail and a beer with them. SO STOKED!! So glad you got your race spirit back. Sometimes silly FUN things are just what you need...and WINNING a silly, fun thing is even better. Have fun at the Epic! You will get your stoke back I know it! Super cool about your potential new bike. The Air9 I'm borrowing is a medium which I didn't think would fit but it does. I also rode a medium EMD for a little bit and that is a sweet ride too. Do you ride a 29er now? 2013 is going to be awesome!! And, AND! I got to eat a delicious dinner! Thanks for cooking MK. While I was watching the bands (honeyhoney especially) I did get a stoke boost. It occurred to me that the people on stage were totally living their dream. And that is stokealicious! !